Anyone taken the CHONC yet?? I'm considering it and curious to know what types of things you came accross that you weren't expecting. Any clinical trial questions? A lot of drug conversion questions? 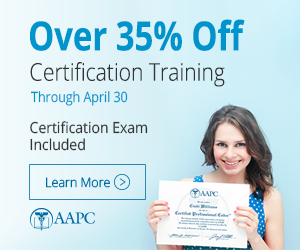 Did you purchase the practice test from AAPC and find it helpful? What extra resource did you use and was it helpful? Thanks for the info!!! 9 of the 11 coders we have here have taken and passed the CHONC test since January. If you are an experienced Med Oncology coder you should have no problem witht he exam. There are E/M questions so be sure to review that first. Remember that the answers do not reflect real life coding that can differ from CPT guidelines. Remember that the answers do not reflect real life coding that can differ from CPT guidelines. Good questions, Katy! I will be taking my CHONC sometime in the spring of 2011; I have purchased the AAPC sample test and will definitely get their study guide. I've seen that so many of the AAPC exams are in line with the study guide and the sample tests; well worth the money to not have to sit thru the 5.5 hours of stress more than once! Good luck; maybe we can keep each other posted! Thanks, gals! Sounds good. I'm planning to have my test taken by the end of the year. I'll let you know! I took my CHONC at the beginning of this year and didn't have any problems. I did get the study guide and reviewed areas I wasn't familiar with (our office doesn't routinely do IVPB) so I had to make sure I read each question carefully. I have taken the exam. If you work in Hemotology and Oncology currently the exam will be much easier. I felt that I was prepared but there still were some things that were tricky. However, by purchasing the exam booklet it was extremely helpful. Reading up on all the CPT's codes in the beginning of the chapters and HCPCS it was helpful. Also, as for the drug conversion, that's a huge portion of my position so I found that easier. Hope this helps and good luck. I'm planning on sitting for the exam this year. I'm nervous about it, too! I'm thinking about taking this exam, and was wondering what type of questions are on the exam. I work in our CDM Compliance office so I'm not actually administering, basically coding. I just passed ICD-9 and ICD-10 and thought i should go for speciailty, I know all the codes chemo and Ther/Proh/Dx, the heirarchy etc all without reference books. I was just wondering what else would be on it. Michelle....I took the CHONC exam in Dec (2014) & passed. However, if you are not or have not recently worked in a hem-onc office, it won't be easy. I've worked in hem-onc for 9 1/2 yrs and still felt I wouldn't have passed without the intense 5 wks of study. I agree 100% it has some components that are not relative to current coding guidelines, but are workable if you emerse yourself in the CHONC study guide. I studied HCPCS, read through every page at the beginning of the ICD code book (more than once). Read CPT and know your infusion codes(! ), I spent as much time on E&M as infusion codes, made notes in my own hand writing as worksheets (similar to those I use daily) for E&M, infusions, and a few others that were my go-to references to save precious time so I didn't have to thumb through my books....you can do this, but cannot paperclip or staple pieces of paper to the books. The HCPCS book is allowed and has several blank note pages in the back that are perfect for this. Hi-lite anything that will save you time. It is intense. The 45 cases are long. Don't dwell on any one case move on then come back if need be. I honestly don't know why you would want to get the CHONC if you don't work in hem-onc as the only component of the exam that is relative to other specialties is E&M. I wish you good luck! Last edited by stitcher927; 02-21-2015 at 10:26 AM. Reason: To add name. I've been coding the procedure part of Infusion Coding, but our codes don't include E&M so I'm looking for anyone's guidance on how to learn that!